If you need a marble fireplace surround that will beautifully complement your home’s décor, turn to the home remodeling experts at 31-W Insulation. We’ve served countless homeowners since our company’s founding in 1972, so you can rest assured that we have the experience and the expertise needed to help you choose the perfect fireplace surround for your home. We proudly offer marble fireplace surrounds from ICM Marble and Granite, one of the most reputable marble suppliers in the world. 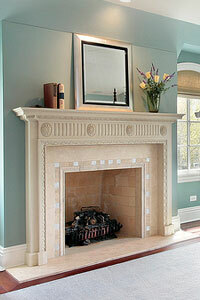 What makes ICM fireplace surrounds so special? No matter the style you choose or the slab of marble you select, your marble fireplace surround is sure to become the focal point of your entire home. And, you can count on our talented team to beautify many other areas of your home. In addition to marble fireplace surrounds, we install bath accessories, door hardware, closet organizers, simulated stone siding, and countless other home remodeling products. You can be confident that we’ll complete your projects with incredible attention to detail using only the finest building materials available. Contact us to learn more about our products and services. We’re proud to fulfill the home improvement needs of homeowners throughout the South and Midwest, including those in Georgia, Ohio, North Carolina, Missouri, and surrounding states.